Like many other institutions, this club owes its existence to a process of evolution which commenced in the year 1870. The love of aquatics inherent in the race, and encouraged by the enthusiastic yachtsman, Governor Weld, led to the formation of a nucleus around which was gathered the present club. On June 4, 1873, Mr. S. H. Parker (now a Judge of the Supreme Court of Western Australia) moved that a club be formed, and the Hon. Secretary submitted a design for a suitable structure to be built on piles in a depth of water sufficient to allow boats to come alongside. This proposition was postponed sine die. On May 22, 1876, at a special meeting convened for the purpose, the subject of the formation of a ‘Boat and Yacht Club’ was discussed. Rules drafted by the chairman (the late Sir James G. Lee-Steere, Speaker of the Legislative Assembly) were adopted, and a committee authorized to canvass for members. At a general meeting of members of the new club held on November 13, 1876, the club was formally established. From that time the annual regattas were held under the auspices of the club, but up to and including the year 1883 the public contributed towards the necessary expenses. On March 8, 1880, the City Council consented to the erection of a jetty and a boat-shed and slip. By September 30, 1884, the title of the club had been altered to ‘Perth Yacht Club,’ and the membership roll had gradually increased to seventy-one names. It was no longer necessary to appeal to the public for contributions, and the club was made self-supporting. After flourishing for three years, the club finances became so unsatisfactory, owing to departures, deaths, and default in paying subscriptions, that a special general meeting was held on August 9, 1889, and, after much discussion, it was decided to raise the amount of annual subscription from £1 1s. to £3 3s., with an entrance fee of £1 1s. How much the club then flourished is shown by the fact that in 1889 a new club-room was built over the club-house at a cost of £230. The title ‘Royal’ was conferred upon the club by her late Majesty Queen Victoria. 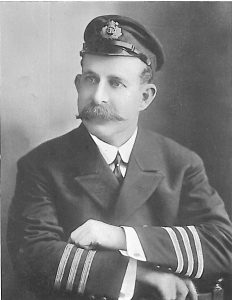 The Admiralty warrant was not applied for till 1903, and Admiral Sir Frederick D. Bedford, G.C.B., Governor of Western Australia, conferred the warrant on July 4. The lead which the Royal Perth Club had given to yachting generally was followed by the establishment of several other yacht and sailing clubs on the estuary of the Swan. A large fleet entered for any open races, and it was no unusual sight to witness sixty spinnakers set on the run home. About this time, too, a number of raters were imported from the Eastern States, and built locally – a revolution in contrast to the straight-stemmed cruisers which previously contested for pride of place. So many of these racing machines were commissioned that it became necessary to classify them separately, leaving the keel boats to sail under handicap allowances in their several classes. The progress made by the Royal Perth Yacht Club is shown in the magnificent new club-house which was erected in 1905, adjoining the old premises. The new house contains all modern conveniences, and is a handsome and well-built structure. The membership roll of the club in 1906 was ninety-eight. On the evening of October 15, 1867, a number of boat-owners and other aquatic supporters foregathered in the commercial room of McGrath’s Hotel in King Street and organized what was first known as the Mosquito Yacht Club, which club, after thirty-nine years of continuous working, has developed into one of the most progressive yachting institutions of the Southern Hemisphere. The reason for the inauguration of such a club was stated to be that the Royal Sydney Yacht Squadron, which had been in exist­ence for some four or five years, did not cater for the smaller boats, and that some organization for the proper control of racing amongst such craft was considered to be necessary. Nowadays there are numerous sailing clubs which foster the small boats of all classes, and the Prince Alfred Yacht Club, together with the Royal Sydney Yacht Squadron, look after the interests of the yachts only. In this connection there has been much argument of late as to what constitutes a yacht, and the question has proved quite as vexatious as the problem of arriving at a satisfactory definition of an amateur. At the inaugural meeting it was decided that the title of the new body should be ‘Prince Alfred Yacht Club,’ in honour of the then recent visit of his late Royal Highness the Duke of Edinburgh, and royal patronage has been extended to the club ever since its inception. Success appears to have attended the beginnings of the club, for in two months no less than twenty yachts were registered and eighty members enrolled, and for thirty-two years this latter number was not exceeded. On application to the Admiralty some eighteen months after inauguration, a warrant was issued authorizing the yachts of the club to fly the blue ensign, with a ducal coronet in the lower fly. At the same time it was decided that the burgee be blue ground, with broad red cross, and these flags have been in use up to the present day. Commodore of the Prince Alfred Yacht Club. Not only was Mr. Harnett a keen sportsman, but one with original ideas regarding yacht design and construction. So far back as 1868 he conceived and put into practice the idea of a boat with cutaway ends and a fin keel – truly a primitive form of the present-day racer. On these lines he produced Australian, a boat that had a remarkable record extending over nearly twenty years, despite the fact that when the model was shown to such eminent builders as Hatcher of Southampton, White of Cowes, and Ratsey, they ridiculed the possibility of such a craft being able to sail. In the absence of evidence of great vitality and enthusiasm it can only be concluded that from 1872 onward the club affairs drifted on in a steady way for a number of years, continuing with the orthodox opening and closing functions, and ordinary racing events in the sailing seasons, until towards the end of 1899, when we find the commencement of a new era. For the last quarter of the nineteenth century the club had existed with an average membership ranging between seventy and eighty. Younger members were not satisfied with this, and advocated the opening of a club-house, and, after much discussion, spacious rooms were opened in the heart of the city. This progressive policy was rewarded with a great influx of new members ; and so great was this increase that it was found necessary to double the accommodation, and between the annual meetings of 1899 and 1900 the membership increased nearly 100 per cent. In 1899 the members numbered 77; to-day there are 280. The fleet, according to the register, has also increased to between 60 and 70 vessels, the majority of which are of an up-to-date type. The introduction in 1900 of half a dozen modern-designed 30-raters also gave a fillip to the club’s progress, and this served to revive interest in racing. As indicating the increasing popularity of the contests conducted by the ‘Alfreds’ (as the club is colloquially known), the committee have found it necessary during recent seasons to engage a steamer capable of accommodating 400 to 500 members and friends who wish to witness the various events. With the finish of the 1904-1905 season came evidence of further progress. The club flag now flutters above the roof of the highest building in Moore Street, in the centre of the city. The new quarters are spacious and airy, and from the windows glimpses of the port may be obtained. The premises have been most economically and well apportioned, the card-rooms and the cosy library being specially attractive features. Port Jackson, the world-renowned harbour and the home of the club, is for eight months of the year a scene of aquatic animation. Steam yachts, power boats, and sailing craft of every size and description, from the stately old-fashioned cruiser to the tiny six-footer, flit about a beautiful expanse of water, bounded by 170 miles of foreshore of bays and coves, that show the touch of Nature’s best handiwork, with an environment of unimaginable colour, to constitute a spectacle that must be seen to be appreciated. The club’s programme opens towards the end of October with a cruise to the rendezvous, and the racing of the season admits of all the yachts of the club entering. The prize-money aggregates about £225, and there are several handsome trophies sailed for. To keep the sport strictly amateur has ever been one of the traditions of the club. Amongst the early rules was one which stipulated that all yachts competing in a club race must be manned entirely by members, and after thirty-nine years – whilst membership is not now enforced – the amateur status of each man of a racing yacht’s crew (except the regular paid hand or hands, according to size) must be maintained, and it is compulsory that the man at the helm shall be a member. Ancient Schooner Yacht, Petrel. One of the earliest yachts at Port Jackson. Times out of number have various writers endeavoured to fix the origin of yachting, and just as many times have the well-meaning scribes failed to trace the exact date when a boat was first built for racing or pleasure purposes. A modified repetition of the difficulty experienced by the historians of the world’s yachting presents itself in tracing the date of the inception of yachting as a sport in Port Jackson. To trace the evolution of local yacht-designing, from the old, beamy, full-bodied vessel to the fin-keeled modern rater, would involve a scientific and far too voluminous disquisition. Probably the earliest records of yachting in Port Jackson have passed away with the many brave yachtsmen who have sailed into the ‘great beyond.’ Nevertheless, some veterans remain to beguile an hour for the modern enthusiast with amusing personal reminiscences and entertaining anecdotes of the early days of the sport. It is on record that the first pleasure-boat in these waters was one owned by a Mr. Robert Campbell. She was an open boat of about 3 tons yacht measurement, built in 1827 – a three-sticker with sliding gunter sails, which was then the most approved type, being particularly recommended for their windward work. Nowadays, if upwards of 500 or 700 people are present on the flagship at a regatta, it is considered a good attendance; but in the old days, when there were not innumerable holiday resorts within easy distance of the metropolis, and travelling facilities and cheap excursions were unknown, almost the entire population turned out to witness an aquatic carnival which to-day would be considered of mediocre order. The first regatta was held on January 9, 1834, the promoter of which was a certain Captain Daniels of the clipper ship Rubicon, who is said to have fairly stormed the community when his vessel was in port. The sailing races in this carnival were contested with the boats belonging to the vessels from oversea ports. They were, however, fitted with temporary keels to increase their stability and weatherliness. Contemporary records describe the gathering at this event as the most numerous and select that ever assembled in the colony, and the heights surrounding Fort Macquarie were crowded with enthusiastic spectators. To celebrate the forty-ninth anniversary of the colony in 1837 a regatta was organized, and this was the first of the many excellent regattas which have been conducted annually for the past sixty-eight years; but at this, again, the sailing races were confined to open boats, and it was not until 1839, or in the early forties, that decked and ballasted yachts appeared in history. The ballasting was not then done with lead fitted to the keel in the manner to which we have become accustomed, but with iron or, more often, heavy stones packed in the lower hold. The Haidee. From an original painting. Amongst these early craft the most prominent were Friendship, Haidee, and Petrel. The first-named was built as a cruiser, but her exceptional turn of speed led to the late Mr. J. Milson’s father purchasing her. She was rigged with sliding gunter sails, and beat all her class, notably in the regattas of 1840 and 1843. Haidee was built for the late Hon. George Thornton, and was winner at a regatta in 1839; but she came to a tragic end in a southerly burster, sinking in sixteen fathoms off Shark Point, and five out of six of her crew were drowned. Another yacht owned by the late Hon. George Thornton was the Midge, which carried off the prize for second-class yachts at the Anniversary Regatta of 1845. Just about this time the gaff mainsail was corning into fashion, though the Midge’s success was achieved with the sliding gunter rig. 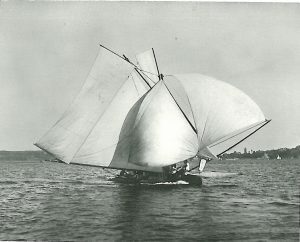 Champion, built in the following year by Underwood, was another of the many yachts owned at various times by Mr. Thornton. It was with this boat and the Alarm that the Eclipse – one of the most notable yachts ever built in Sydney – had her first race in 1851. When the Eclipse was being constructed by Holdsworth, a hoarding was erected round her to preserve secrecy of the design, which was from the model of a famous English yacht. Her first match occasioned quite a furore in aquatic circles, and it is said that the late Mr. Alfred Fairfax, who afterwards owned Eclipse, obtained a horse and galloped from point to point in order to witness the whole contest. From 1851 onwards there were many good boats which had remarkable careers, and kept the sport alive up to the beginning of the present era. It would not be possible here to do justice to such famous boats as Neried, Mischief, Mistral, Xarifa, Alec, Magic (champion from 1873 to 1885), Doris (winner of the intercolonial race for 6-tonners in Port Philip in 1883), Waitangi (which defeated the Victorian crack Janet in 1886), Violet (Mr. F. J. Jackson), Sirocco (Mr. E. W. Knox), Era (Mr. A. G. Milson, winner of the inter-colonial event in Port Philip in 1888), which kept the sport moving between 1855 and 1894, for their achievements alone would require a volume. But it would not be right to proceed without some mention of Australian – the ‘old beakie,’ as she was stigmatized by the facetious – which flourished between 1866 and 1890. She was a creation of the late Mr. Richard Harnett, and though a decided departure from the traditions of yacht-designing up to that time, it had to be admitted that she was unique in design, stanch in construction, and fast in sailing. She possessed what were considered essential elements of a successful boat – small skin, relatively big displacement, and perfectly gradual approach and delivery ; and it may reasonably be contended that in her design were many of the features (though in a crude form) which have been so successfully developed in the modern type of racing yacht. For a period extending over a quarter of a century in the history of yachting in these parts the attention of builders ran in the direction of attempting to create a new code of natural, or rather unnatural, laws, including excrescences of every conceivable description: wall-sided packets with straight keels and plumb stems, inordinate dead-woods aft, and deep rectangular forefeet, to say nothing of the bulk of the floating power being unscientifically concentrated. Some few years ago, however, yacht-builders returned to normal ideas, and, as one of the best authorities logically puts it, instead of trying to batter the water into their way of thinking, they succumbed to the dictates of natural laws, and built accordingly. We come now to the last decade, with the accompanying innovations – overhangs, fin keels, hollow sections, and balanced rudders. 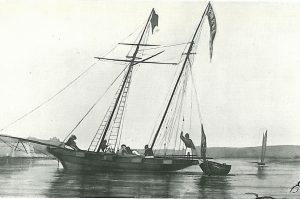 Although the length and sail area measurement rule was adopted in 1887, it was not until 1895 that a yacht was produced to take full advantage of its provisions, Mr. James Cox built Herreshoff a 5-rater of shallow hull and with bulb-fin and other novelties – and it was predicted before her launching that she would show a clean pair of heels to anything up to 10 tons in Port Jackson. Given her time allowance, there is no doubt the other yachts only had a view of her taffrail from start to finish, and the 10-tonners and others had to look to their laurels when racing her from scratch. In 1898 Mr. S. Hordern (Commodore of the Prince Alfred Yacht Club, 1892-1905) imported designs from Fife of Fairlie, and had Whitewings built by Ford, of Berry’s Bay, and she eclipsed all her predecessors. From this date onwards there was a growing inclination amongst the yachtsmen to entirely modernize the fleet. 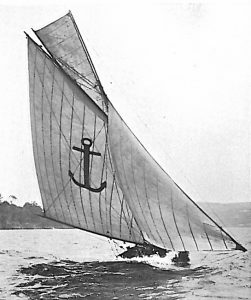 In 1899 Dr. J. Elliott bought Meteor (30-linear rating) from Auckland, and later in the same year Mr. C. T. Brockhoff introduced Aoma, a boat of the same type and about the same size, built by Messrs. Logan Bros., of Auckland. Both these boats were of the fast cruiser type – a healthy class, well adapted to the ideas of Sydney yachtsmen; and, Mr. Brockhoff being so successful with Aoma, others were induced to import similar craft. The beginning of the 1900-1901 season, therefore, saw five more 30-linear raters in our waters. Mr. Hordern secured designs from Fife and had Fleetwing built in Sydney; Mr. S. M. Dempster and Dr. Gordon Craig imported Petrel and Heather respectively from Auckland; Mr. J. O. Fairfax brought out Magic from the yard of Messrs. Summers and Payne; and Mr. A. W. Crane procured Cooya from A. W. Bailey, of Auckland. Bona (Mr. J. E. Chinnery), 36-rater, was also imported about the same time, and she proved herself to be the champion of the harbour. Petrel. Mr. S. M. Dempster. Twentieth-Century Regatta, proved more than a match for Magic. 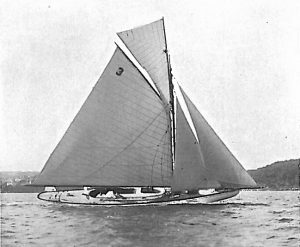 Sunbeam was purchased by Mr. Fred Doran (the well-known amateur skipper of the smaller class of racers), who was most successful with her. Later she became the property of Mr. Arthur Crane; but the change in rating affected her and Magic more than any of the others, and where they formerly received time they were compelled to concede allowances to the scratch boats. The racing was, however, much closer and more exciting. In the 1904-1905 championship competition of the Prince Alfred Yacht Club Petrel won with eight points out of a possible nine. Petrel has always shown a decided liking for ocean racing. Kukuburra was a new boat that season, built for Mr. A. E. Cutler to his own designs. Mr. W. M. Marks also imported Culwulla, 31.7 rating, and while she was only in racing trim during the latter half of the season she came out with third top score. In the next season, however, her record was bracketed with Petrel in the front rank, and her achievement in beating Bona in the championship of the Prince Alfred Yacht Club is one of which her owner may be justifiably proud. Port Jackson Rendezvous. Opening day, 1903. Scotia is a late addition to the fleet; she is a 30-footer, built for Mr. T. W. Bremner to Fife designs, and is undoubtedly a fast boat, though up to the present she has shown a decided penchant for light weather, for most of her successes have been achieved in light breezes. The racing is just as keen as of yore, though instead of wide intervals separating the competitors at the conclusion of a contest as formerly, when a 5-tonner would start off the same mark as a 25-tonner, we have to-day close and interesting finishes, which require expert judges to discriminate and tick off the seconds as each white-winged flier crosses the finishing-line. It was in 1868 that handicapping and time allowance according to measurement were introduced. Record of Culwulla, l.r. 31.9. Owner, W. Moffitt Marks. In the 1902-1903 and 1903-1904 seasons Fleetwing won the 30-rating championship of the Prince Alfred Yacht Club. Port Jackson Open boats. Showing Ringtail, Ballooner and Spinnaker. Amongst the thousands of sail-borne craft that may be seen upon the waters of Port Jackson during the summer, perhaps the open racing boats peculiar to Australia and which, for their sail-carrying capacity, are of world-wide renown, are the most notable. For some thirty years the genuine centre-boarder has attracted much attention. In that period the type has grown and multiplied exceedingly and has been divided into classes, all of which have increased amazingly. The class, as a spectacular one, is pre-eminent. There are few grander sights in local waters than a group of 22-footers smashing along to windward against a fresh breeze; and no finish could be more exciting than with these boats running for the mark in close company, and each staggering under a cloud of canvas, the measurement of which is upwards of 2,500 square feet. The type is the same in all classes, differing but slightly in design according to the ideas of the builders. Speaking generally, the hull is broad, shallow, and powerful. To this is added as much sail as can be kept in a comparatively upright position by the large crew, which is only limited by the capacity of the boat. The classes have changed somewhat from time to time, but those at present in vogue are: 22, 18, 14, 16, 8, and 6 feet. The overall length is the only measurement taken into account for racing purposes. 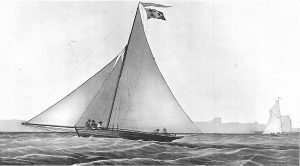 A 22-footer rigged for racing, in a moderate breeze, will have a mast some 30 feet high, a boom from 32 to 35 feet, bumpkin 18 feet over the bow, and gaff 18 to 20 feet. On these spars 900 odd square feet of snowy canvas is spread for working to windward; while running down-wind it is usual to add a spinnaker of an area exceeding that of the mainsail – set from the peak of the topsail, which mounts skywards some 45 feet – and a ringtail of 500 square feet set, something like a studding-sail, on the leech of the mainsail. One notable boat – Plover – with everything cracked on, before the wind, carries a spread measuring 72 feet from the end of the main boom to the tip of the spinnaker pole. Another class, which perhaps stands highest in favour amongst open-boat sailers nowadays, is the 18-footer, the history of which dates back to 1885. These craft are of about 9 feet beam, and carry a working sail area of something like 700 square feet; but on a run, with every stitch aloft, an ‘eighteen’ presents to the wind an effective driving surface totalling some 1,500 square feet. Roughly speaking, the dimensions of an 18-footer’s spars are: Mast, 25 feet; boom, 27 feet; gaff, 15 feet 6 inches; bumpkin, 15 feet, and spinnaker pole (telescopic), 25 feet. It will be understood that these big figures apply to light and moderate weather; that when the breeze pipes high the open-boat sailor comes out rigged for the day, although even then, to the eye of the uninitiated, his boat appears to be much overcanvased. Blow high or blow low, however, the most consummate seamanship is required to keep them right side up. A crowd of excited spectators generally follows the races, and does its utmost to reach every possible and impossible coign of vantage in order to get a glimpse of a close finish between favourites. A class that has found much favour during the past two years is the 16-foot skiff, which is exclusively catered for by the Port Jackson Sailing Skiff Club. This is a restricted class, beam being limited to 5 feet 10 inches outside mouldings, and the sail to 220 square feet. Results indicate a good future for the skiff; it is quite a common thing to see an entry of fifteen or sixteen boats for a single race. The Sydney dinghy is not only the subject of wonderment amongst the uninitiated who look on from the deck of a harbour steamer, but their sail-carrying capacity has been commented upon in tones of amazement by sailing experts from all parts of the world. The inception of dinghy-racing may be traced to about the year 1880. The little craft were then known as ‘canvassers,’ and very primitive some of them were, being after the pattern of the coracle of the prehistoric Briton. They were built mostly by boys, who were as keen on boats as Peter the Great; and they were constructed with wooden cask hoops for timbers, battened at about 3-inch centres, and the whole frame covered with canvas or heavy calico. How much annoyance to the neighbours was occasioned by the tinkering and hammering by the boys, whose enthusiasm induced them to work overtime – often into the small hours of the morning – may be appreciated. It was not long, however, before improvements were made, and builders gave consideration to the dinghy, which has developed into the fast, well-constructed boat that races to-day. They are now built of picked cedar, and, except in the 6 and 8 foot classes, it would be difficult to find a canvas dinghy. The modern dinghies are built with a little decking forward and a 6-inch or 7-inch waterway running the full length of the gunwale. In addition, lee cloths are attached to the coamings, and are worked with great advantage, thus minimizing the tax on the energies of the billy-boy (baler), whose task throughout a race is no sinecure. The 10, 8, and 6 foot classes each possess a craft – like the impossible yarn – as broad as she is long, which means that the extreme beam is equal to the length from the stemhead to the stern-post. The beam, of course, tapers towards the waterline, the sides being flared out to enable the midgets to carry their disproportionately large sails. The number of hands carried varies according to the weather; but, as a general rule, the 14-footer has six to nine, 10-footer four to five, eights and sixes two or three. The 6-footer is, perhaps, the most remarkable of the type, being the smallest sailing vessel that carries a crew. Before the wind these midgets spread as much as 230 square feet over a horizontal plane of some 25 square feet, so that it is obvious that to keep the whole fabric out of the pickle is a delicate matter of balancing. The large fleet of open boats is catered for by the Sydney Amateur Sailing Club, the Port Jackson Sailing Skiff Club, the Sydney Flying Squadron, the Sydney Sailing Club, the Sydney Dinghy Sailing Club. The first two are amateur organizations, and no paid hands are allowed in the boats, whereas in the cases of the other three no such stipulation is made regarding the skippers and crews. The Club is the oldest sailing club in New South Wales. The initiation of the Holdfast Bay Yacht Club was due to a small coterie of enthusiastic boating men resident at Glenelg, which is the chief watering-place of South Australia, and is designated the ‘front door of the State.’ The first meeting was held on October 12, 1883, and was attended by Messrs. J W. Billiatt, H. Porter, I G. Beaver, C M. and J B. Muirhead, J Hawkes, and A. Le Rey Boucaut. Mr. Billiatt, who was a member of the exploration party who traversed the continent of Australia from south to north in 1861 under the leadership of the late Mr. McDuall Stuart, was elected Commodore, and Mr. Boucaut acted as Hon. Secretary. The members on the roll for the first season numbered twenty-five, and there were nine boats on the register, the craft ranging from a 4-ton cutter to a 14 feet 6 inches open boat. A series of races was commenced, the handicapping for which must have been a difficult task. The Mylora proved herself the clipper of the fleet, placing two wins to her credit. In the early part of 1884 severe gales were experienced, which proved disastrous, some of the boats being wrecked and others damaged, necessitating the abandonment of the race programme. The next season saw the club in a better condition than the preceding one. Owing to an entire absence of shelter in Holdfast Bay from the north-west, west, and south-west, when heavy weather strikes Glenelg it generally takes toll from the boat-owners of the club. In 1902 only two or three of the boats survived an especially heavy gale. The Admiralty warrant was granted the club in August, 1888. Some valuable trophies have at times been presented by supporters of the club, and one which is raced for annually is the Plymton Cup, valued at 150 guineas, presented by the late Captain Morish. There is a clubhouse on the foreshore fronting the Glenelg Town Hall, surrounded by a greensward. The club at present is both numerically and financially in a flourishing condition, but the number of boats on the register is relatively small. The season opens in October. 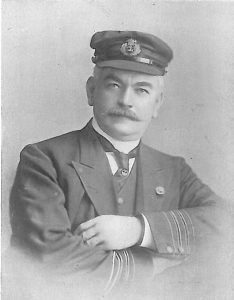 The officers of the club are: Commodore, Mr. H. J. D. Munton; Vice-Commodore, Mr. C. G. Tolley; Rear-Commodore, Mr. F. Bills; and Hon. Secretary, Mr. F. W. Wilbraham. Intercolonial racing has not been carried on to any great extent, though there have been a few notable contests. In the last two decades (prior to the recent matches) there were but three repre­sentative contests in which New South Wales and Victoria took part, and on each of these occasions the Sydney boat finished a winner. In 1883 the late Dr. Milford (then Commodore of the Prince Alfred Yacht Club) sent his 6-tonner Doris to Melbourne to compete in an intercolonial regatta that was being conducted at Port Phillip, and she was easily champion. This stanch little craft made the voyage to Melbourne through tempestuous weather, and sailed back again after her victory. To-day she is numbered amongst the ‘old-timers,’ but is still used as a cruiser in Port Jackson. Some three years afterwards the late Sir William Clarke nominated his 30-tonner Janet as a challenger to try conclusions with any yacht in Port Jackson. The matter of defence was enthusiastically taken up by the late Mr. Alfred Fairfax, owner of Magic, 39 tons, and Mr. A. G. Milson, owner of Waitangi, 21 tons. For a long time Magic had been regarded as Sydney’s crack, and to her it was looked to uphold the reputation of Port Jackson. To the surprise of everyone concerned, however, a view of Waitangi’s taffrail was all that the other two competitors could see throughout the race. Mr. Walter Reeks had been given a free hand to put the yacht in the best possible racing trim; and, by making certain alterations, the naval architect effected such an improvement in Waitangi that she was able to beat her old rival without time allowance. Without the increased speed of Waitangi the honours must have gone to Victoria, for Janet easily defeated Magic. The representative yachts of the two States met again at the Centenary Regatta in Port Phillip in 1888. The Era, 40 tons (Mr. A. G. Milson), and Volunteer, 30 tons (Mr. Smairl), went from Sydney; South Australia sent Wanderer (Mr. Fergie); while as representatives for Victoria Taniwha (Mr. G. Turnbull), Janet (Sir William Clarke), and Iduna (Mr. Gurner) were aspirants for inter-colonial honours. The race was described as most exciting, and at the finish Era was first, Volunteer second and Wanderer third. For fifteen years no further attempt was made by the Victorians to wrest from New South Wales the supremacy of yacht-racing. In January, 1904, Mr. Alfred Gollin, of Melbourne, brought Sayonara round as the Victorian representative to meet any yacht in Port Jackson, and Mr. H. Binnie’s Bona was selected and fitted out to meet the challenger. Earlier in the same season an attempt was made to draft conditions involving the establishment of a perpetual challenge cup; but this was found impracticable owing to the yachtsmen of the two States not being able to agree about certain terms, the chief point in dispute being that the challenger should sail to the port of contest under her own canvas, a condition to which the New South Wales men were averse, seeing that a racing yacht of the size (up to 40 L.R.) and type (modern) is not a suitable craft to make a passage between the two ports, having regard also to the great advantage that lies with the defender in the matter of lightness of construction. 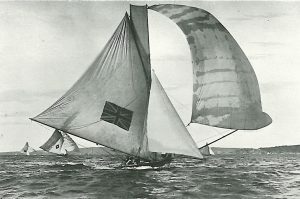 Sayonara (42.2 L.R., of Fife design) was more of a cruiser than a racer, and appeared to possess all the necessary qualities of a successful billow-puncher, though this remark must not be taken to infer that the Melbourne yacht was a slow wave-bruiser; on the contrary, she gave conclusive proof of her weatherly qualities and of her speed on all points of sailing. Mr. W. Robb was in charge of Sayonara, who navigated the yacht from the southern capital, while Bona was steered by Mr. S. M. Dempster, whose record in his 31.9 rater Petrel is an enviable one. After his victory Mr. Gollin re-presented the trophy – which he designated Sayonara Cup – as a perpetual challenge cup for competition between the two States with yachts up to 52 L.R., and imposing the condition that the challenger must sail to the racing port. New Zealand yachts have on several occasions been brought to Port Jackson to compete in various events, though there has not been anything recognized as involving championship honours. Mr. A. T. Pittar brought over three successful boats – viz., Meteor, 30 feet, in 1899; Rainbow, 36 L.R., in 1900 (which tried conclusions with and defeated Mr. S. Hordern’s Whitewings); and in 1901 Sunbeam, to compete in the Twentieth Century Regatta. On the latter occasion an intercolonial event was programmed, but was abandoned owing to the death of the late Queen Victoria. Read on … Colonial Yachting – Canada.